Product #5797 | SKU FPW00902 | 0.0 (no ratings yet) Thanks for your rating! The Nikon PK-13 Auto Extension Tube provides 27.5mm of extension, and can be used with any Nikon SLR lenses longer than 50mm, or with a reversed 50mm lens (using a reverse adapter). The PK-13 fits between the camera body and lens either single or in combinations. Nikon cameras using these support them in Manual focus mode only and they are considered non-CPU lens attachments. See your cameras manual for more details on compatibility. Provides perfect coupling and retains both AI aperture and metre coupling. Does not support AF operation. 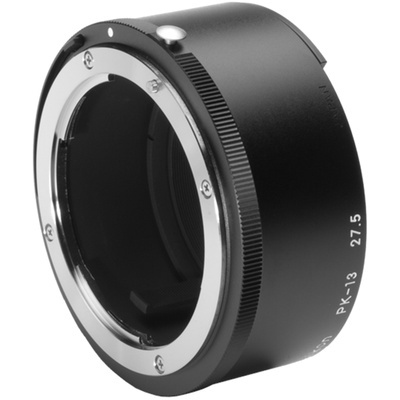 The PK-13 provides a reproduction ratio of 1:1 when used with the Micro-Nikkor 55mm f/2.8 lens. Box Dimensions (LxWxH) 2.9 x 2.8 x 2.4"